A largely hand-made piece in comparison to most of my videos. 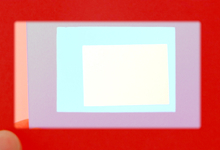 Cut Out involves different coloured cards, with apertures cut out of them, superimposed in combinations starting from opposite ends of a simple spectrum (from yellow to blue). The method of superimposition is more complicated than it might at first seem, adding to the instability of the various planes, edges and colours.